A smaller but serious-sounding 'multi-purpose' electro. When we looked at Martin's initial Dreadnought Junior we concluded that it was "faultless in concept and execution." But if you were after a more bluesy vibe'd instrument, the bright spruce top wasn't ideal, and you may have looked elsewhere in what is a rapidly growing and competitive market. It's an issue that Martin is keen to address with its latest addition to the Junior range, the 2E Sapele. The Junior is Mexican-made, but unlike many travel guitars, is entirely made of solid wood, save for the synthetic Richlite ebony-alike substitute used for its fingerboard and bridge. Do we care? Well, we should. Made properly, like a Martin, this lil' dread's all-solid sapele build should mature with playing and age into a bigger, rounder-sounding instrument that is far from just a travel axe to be chucked into the back of the care. 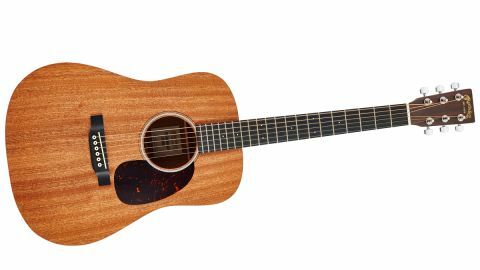 Yes, it falls into the smaller travel genre but it's 15/16th's body size, 610mm (24-inch) scale and wide nut and string spacing means it's full size in every other respect plus it comes in either acoustic (£499) or electro, as here, formats using a discrete Fishman Sonitone system with soundhole-placed volume and tone that's perfectly fit for gigging purposes. If you care about the craft, then the Dread Junior is first class. Its natural finish is a hand-rubbed oil, which might not be the most robust coating but is extremely thin and pushes resonance to the fore - it also means any sloppily workmanship is easily spotted but there really isn't any. Okay, there's no binding around the body and it'll wear more easily than a more standard 'poly' finish but for many of us, that's part of the fun. Its reduced scale is like we've capo'd a standard guitar at the 1st or 2nd fret. Initially, it feels a little cramped but it soon becomes your best friend, picked, strummed or, as we found, tuned in open G or D for bluesy bottleneck. The shorter scale may limit some dropped tunings but there's no reason why you can't up the string gauge if that's how you want to use it. There's surprising power and projection to and it sits really well with a full size dread, its trimmed low-end and strong midrange really pokes through and for recording, especially capo'd, it adds a lot of texture. Plugged in, while we only have volume and tone (a treble roll-off) and no tuner, it's a pretty honest sound, perfectly good for those open-mic slots, and with a little outboard EQ, you might be surprised just how 'full-size' it sounds. It's certainly not as dark as its construction might suggest while the hardwood top adds subtle compression. A smaller but serious-sounding 'multi-purpose' electro.